The story goes that an Irish politician arrived in New York and unexpectedly had to stay overnight. The hotel clerk said, ‘sorry we’re full up’ until, that is, the politician dropped the fact that he was a Senator in the Irish Parliament. He was then asked to wait while the clerk rushed off and within a matter of moments Senator X had his room. Why? Because Americans know that their Senators have real power and influence and the clerk assumed Irish Senators are the same. Not so. But this wasn’t the first Irish Senator to find that arranging a meeting, getting a hotel room or a taxi or booking a restaurant in the USA is always made easier when the title ‘Senator’ is affixed to the name. The perception is greater than the reality. And now the future of the Seanad (Senate) hangs in the balance. 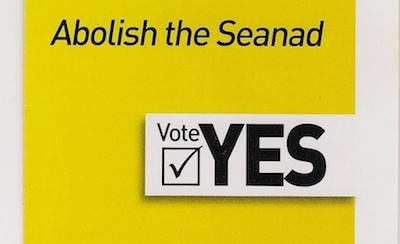 On October 4th a referendum will determine whether the Seanad stays as is or is abolished. Sinn Fein would have preferred voters to have the additional choice of opting for root and branch reform and we proposed that the government hand the issue over to the constitutional convention for discussion and recommendation. But the government rejected this and has only allowed foe a YES or NO response to abolition. In these circumstances Sinn Fein is calling for YES vote to abolish the Seanad. The Seanad is an anachronistic, elitist and undemocratic institution which seeks to emulate the role of the equally elitist British House of Lords. It is not elected by the people but by only one per cent of the electorate. It has 60 members. Six are elected by the graduates of some universities; 43 are elected from five panels of nominees, which supposedly represent key elements of society, such as agriculture and education, public administration, the trade unions and business; and 11 are nominated by the Taoiseach. Today’s Seanad was created by the 1937 Constitution and in the decades since , with a few honourable exceptions, it has become synonymous with cronyism and corruption, particularly by the Fianna Fail party. That party used the system of political nominees to reward close political allies. The Seanad was also used as a safety net for those who failed to get elected to the Dail. At no point has the Seanad acted as a real check on the actions of the government. Since Fine Gael and Labour came to power two and a half years ago the Seanad has supported the government on every occasion, including the introduction of the Property Tax, cuts to the money provided to carers and the disabled, and a succession of austerity policies that have forced up unemployment and forced out over 300,000 citizens to Australia and Canada and the USA. In addition the Seanad has no power to put questions to Ministers; nor can it prevent government legislation from becoming law and almost all amendments proposed and adopted by the Seanad in recent years was with the government’s agreement. No democrat can in my view support a body as flawed, powerless, undemocratic and discriminatory as this. However, thus far the political and public debate around the referendum hasn’t really sparked. The refusal of the Taoiseach to debate the issue on television has excited some interest. The Fianna Fail party which had called for abolition in its last election manifesto has flip-flopped on the issue and is now campaigning for its retention and reform. Its leader Micheal Martin claims that reform is possible. He has even gone so far as to suggest that a reformed Seanad would allow for northern representation and for the diaspora to be represented in the Dail. Few take this Damascus-like conversion too seriously. The Fianna Fail leadership is desperate to rebuild the party after its disastrous showing in 2011. Martin believes that this tactical political position will provide him with a political platform to oppose the government and secure much needed media attention. This is the same Micheal Martin who as part of the last government refused to hold a by-election in Donegal South for purely party political interests and with no consideration for the voters of that area who were left under represented. This is the same Micheal Martin who supported Bertie Ahern throughout his time as Taoiseach and saw nothing wrong with using the Seanad to reward political cronies. This included using secure car parking and access to the Dail members bar for close associates, including the general secretary of the party. This is the same Micheal Martin who was part of a government which agreed to allow northern MPs to speak in the Dail without voting rights as part of the peace process negotiations and then reneged on that. In his fourteen years in the Fianna Fail government neither Mr. Martin nor his government made any effort to reform the Seanad. So can their latter day conversion to reform be believed? I don’t think so. But Fianna Fail are not alone in how they abused the Seanad. Despite numerous claims over the decades by all of the establishment parties that they would reform the Seanad none ever did. On 12 successive occasions reports were produced proposing reform. None was ever implemented. In 1979 the people voted in a referendum to broaden the franchise to all graduates of institutes of higher education. It gathers dust on a shelf somewhere. The fact is that no government has ever been prepared to allow the second chamber to scrutinise in a meaningful and effective manner its legislative programme. There can be no place in a democratic system for an elected institution to which only a tiny minority have the right to vote. All citizens must be treated equally. It is also clearly unjust that citizens right to vote is determined by their level of education. So, on October 4th the electorate will have their say in referendum. I am asking that they vote to abolish the Seanad. Of course that doesn’t mean that what remains is fine. On the contrary the political system needs significant reform but that’s for another blog.